Eastern South Dakota attracted a large German population in the late 1880’s. There were several Lutheran congregations in Grant, Watertown and Hamlin counties. In the 1870’s and early 1880’s these congregations were served by a circuit pastor, stationed in Marshall, Minnesota. 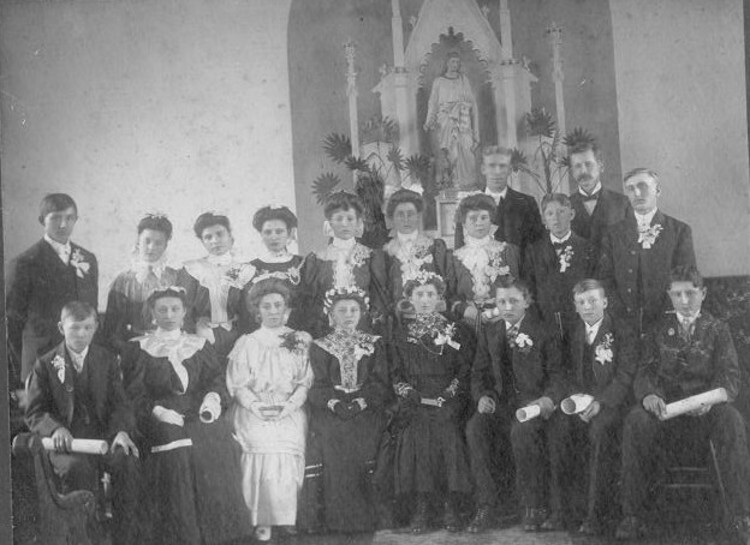 In 1884, the Minnesota Synod called a full-time pastor to serve the three counties. Even then, he could only be at each congregation once every three weeks. He was paid $85 a year and a bag of oats per member. 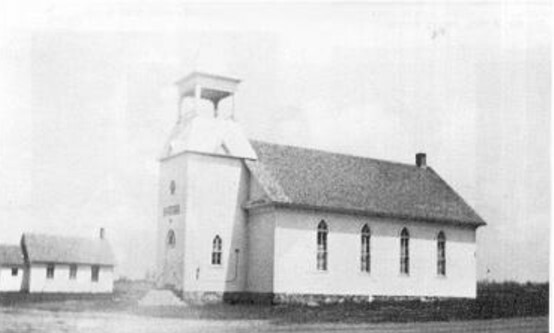 My Great-Grandpa Herman Krause was on the organizing committee for the Mazeppa Congregation, first called St Paulus Gemeinde, then given the present name in Jan of 1897. Prior to 1916, all services and confirmation instruction were conducted in German. This is my great-great-grandpa Carl Korth, on his land, directly across from the little German church. He came from Jacobsdorf, Pommerania, Germany in 1878. Also in the picture is his daughter Hannah, granddaughter Hazel Rodner Moore and grandson Clinton Rommel. He is pictured on his land, which was across from the original church before it was moved to face south. 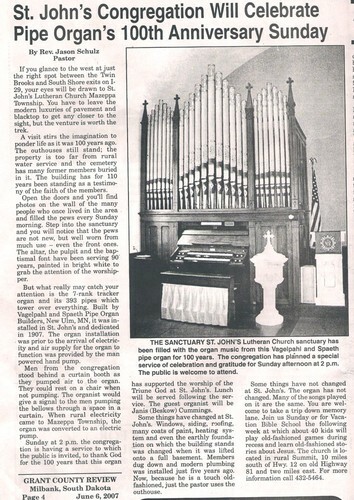 1907 The Newspaper reported that Mazeppa Church was passing the hat for the new organ. Mar 5, 1908 Organ Dedication: Lutheran Church in Mazeppa Township to have Ceremony. 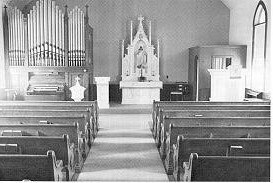 The members of the Mazeppa Lutheran Church have purchased a fine new pipe organ and will hold the dedication services on Sunday March 22nd. There will be services all day, German in the morning and English in the afternoon. 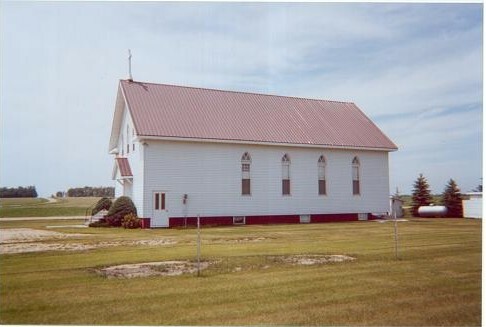 The farmers residing in the portion of Mazeppa and Lura townships adjacent to this church are among the most prosperous in the county and while gaining in worldly goods have always taken a strong interest in church matters. 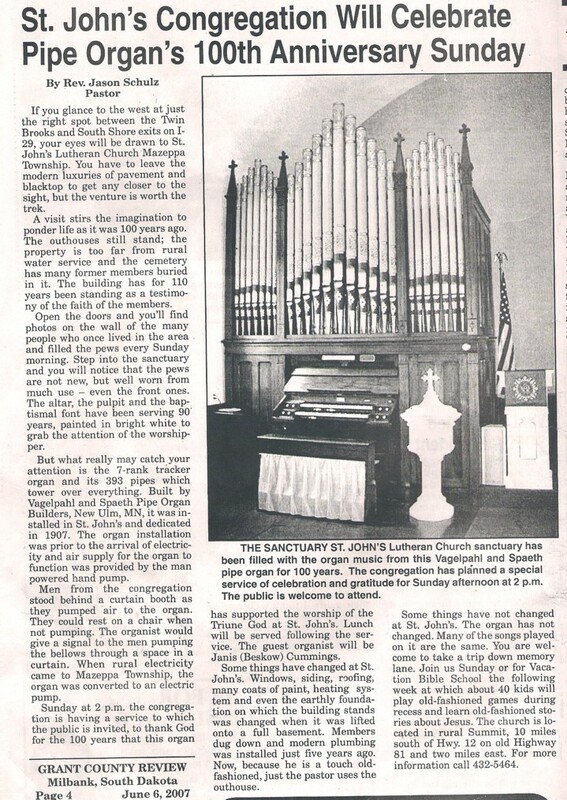 The organ dedication services at the St Johnnas Lutheran Church in Mazeppa townships held last Sunday were very appropriate and successful. The dedication sermon was preached by Rev Polzin of Watertown, and in the afternoon Prof Mayer of New Ulm, Mn, preached in both German and English. The sermons were very impressive and eloquent and appreciated by the congregation. Prof G. Burk, a trained musician from New Ulm, Mn, presided at the organ. A collection was taken which netted $80.00. A Mission Feast was held at the German Lutheran church in Mazeppa township Sunday Oct 18th. There was a good attendance and an interesting time was enjoyed by all. The mission collection amounted to $35. The services were to have been conducted by Rev. Michaels but owing to his being taken with typhoid fever he could not be present. Services were conducted by the presiding pastor both forenoon and afternoon. 1910 Rev Paul Hinderer will open a school in South Shore next Monday for the teaching of German and the instruction of a confirmation class. It will last about three months. (The paper later reported an enrollment of about twenty). June 15th, 1911 On Tuesday of this week, the congregations of the Germantown, Mazeppa, and South Shore Lutheran churches sprung a pleasant surprise on their pastor, Rev. Paul Hinderer, by congregating at South Shore and passing this day in honor of the 25th anniversary of his ordination into the ministry. The day was commenced, holding services in the church here in the forenoon. Rev Hupfer, of Oliva, Minn, preached the jubilee sermon taking his text from the first book of Samuel, 12th chapter and 7th verse. In the afternoon, the congregations gathered in the park and spent a few social hours together. The band got out at three o’clock and played a few selections. Lemonade and ice cream were “on tap” and the band boys were well taken care of their trouble of getting out and playing. Rev. Hinderer is forty nine years of age and entered the church work in his twenty-fourth year. He was educated at the Doctor Martin Luther college at New Ulm, Minn and was ordained at his first charge, LaCresent, Minn. Afterwards he occupied pastorates at Goodhue, Morton and Redwood Falls, Minn. and the combined pastorate of the Mazeppa, Germantown and South Shore churches. The churches at LaCresent and Redwood Falls remembered the day and sent him congratulatory letters. Rev. Hinderer and family occupy the spacious parsonage in Germantown about seven miles west of South Shore. While paying strict attention and devoting his life to the work of the church, he has not neglected his duty to his country, but has reared a sturdy family of ten children, seven of whom were at the festivities here Tuesday. 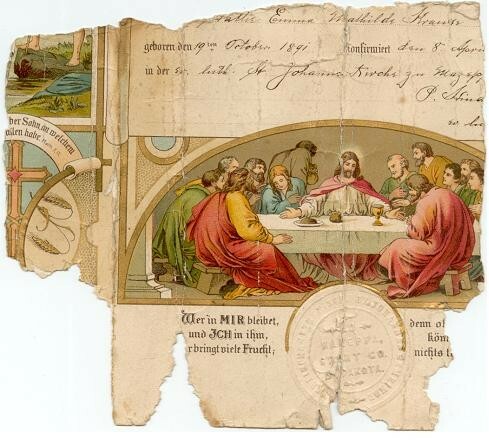 Rev Hinderer is very popular with his parisheners here and all other who know him are confident that the recognition given his anniversary was wholly merited and thankfully appreciated by the recipient. Rev Hinderer requests us to extend his heartfelt thanks to his congregations for their kindness in thus remembering him, also to the South Shore band in helping to make the day a pleasant one. Here’s hoping that the worthy man will live to spend another quarter of a century and more in the service of his Maker and his brethren. Doing my family tree has given me a great appreciation for those early German settlers and the heritage of faith that they have passed on to us. I share that bond with many other members in the Wisconsin Evangelical Lutheran Synod. I know many people in our churches that have a little German church like this in their history. We can be truly proud of our ancestors and their beliefs. June, 2000. St John�s Evangelical Church of Mazeppa Township, 112 years old. 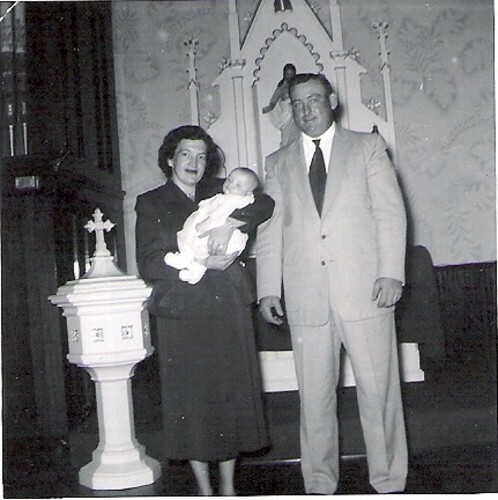 My parents, Norman and Marian Wohlleber Pugh, had not yet established their own church home in Minneapolis, so they brought me to St John's in South Dakota for my baptism.